It’s safe to say that dumplings are some of the most loved foods out there. From the flavorful fillings to the complementary dipping sauces, what’s not to love? And with a limitless list of possible ingredient combinations, dumplings are perfect for expanding your culinary horizons. Fortunately, they are extremely easy to make in the comfort of your own home. They are also inexpensive and offer simple cooking practice for novice chefs. To top it off, dumplings freeze beautifully, making them excellent make-ahead meals. Once you master the technique, consider hosting a DIY dumpling party with friends for a delicious and productive group activity. When it comes to dumplings, most people think of the Asian versions that are a traditional part of Japanese, Korean, and Chinese cuisine. For example, the Japanese have gyoza while the Chinese have wontons and pot stickers. All of these variations fall under the general “dumpling” umbrella. Unsurprisingly, many different variations exist thanks to cultural adaptations and influences. Dumplings can be enjoyed as an appetizer or main course. Typically, they are filled with minced meat and vegetables. 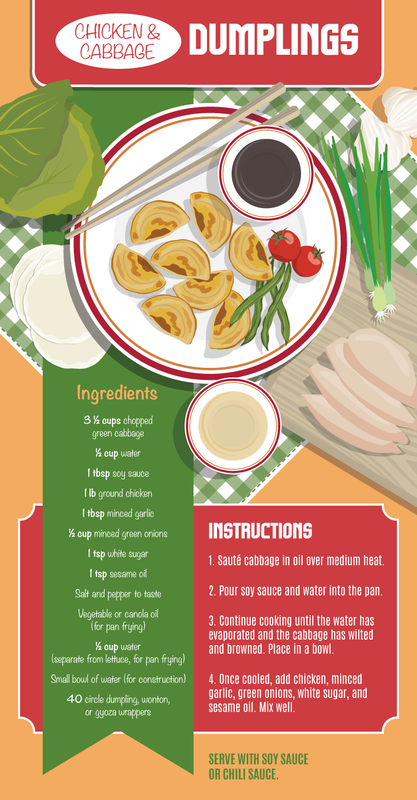 The world of dumplings extends far and wide, however; many other cultures have traditional takes on this tasty meal. For example, pierogis are a staple in Polish cuisine. Empanadas are popular in Latin American and Filipino cultures. Ravioli and tortellini are the Italian cousins of the dumpling family. Needless to say, these bite-size delicacies are a worldwide favorite. It is believed that dumplings originated in China 1,800 years ago. Legend has it that they were invented during the Han Dynasty by a man named Zhang Zhongjian. Dumplings were created as a way of getting the most out of a small amount of meat for an entire family. By mixing up the meat with other fillings and wrapping it in dough, it was easier to split up between multiple people. Traditionally, dumplings are paired with a complementary condiment such as chili or soy sauce. 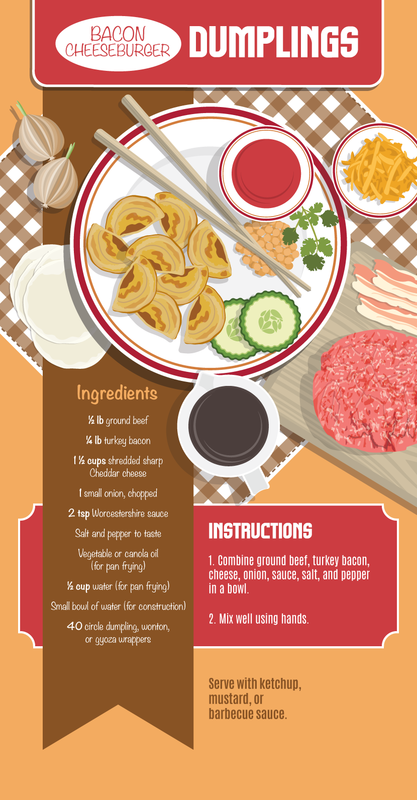 These days, the almighty dumpling is one of the most popular foods out there. From frozen meals to takeout, they can be found whenever the craving hits. Luckily, you don’t always have to trek to the restaurant or place a delivery order to enjoy them. Making dumplings yourself is surprisingly easy. By going homemade, you can use fresh ingredients according to your preferences. Before making your own, it’s important to learn the basics. Conventionally, wheat-based dumpling wrappers are used. These are typically made with a simple duo of ingredients: water and all-purpose flour. You can find these wrappers in the Asian section of most grocery stores or specialty Asian groceries. Depending on the country of origin, the wrappers might state “dumpling,” “wonton,” or “gyoza” wrappers. Any of these options work fine. If you have a wheat allergy, rice-based wrappers are also available. Both work well for homemade dumplings. For each of the recipes below, you will need 40 wrappers. 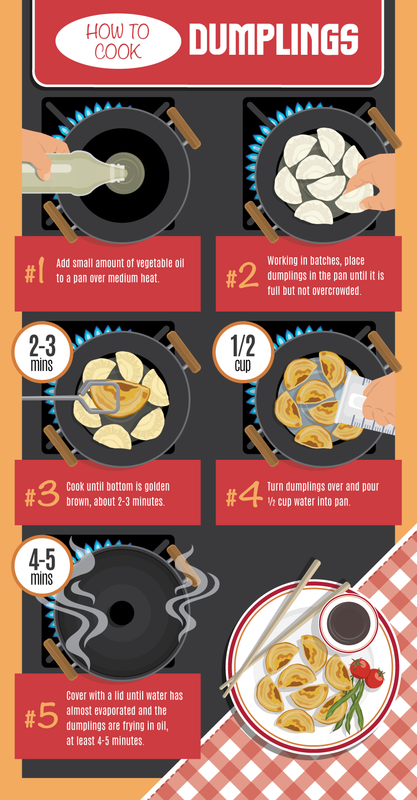 Proper construction is everything when it comes to making dumplings. To start, keep a small bowl of water nearby during the entire process. The water, which doubles as an adhesive, will be used for moistening the edges of each wrapper. Without water, each pocket of deliciousness will not be able to stay together. Like most traditional methods, the best methods require the most basic tools: your own two hands. This will help you shape each dumpling and press each one closed. If necessary, you can use a fork to aid in sealing each one. Otherwise, make sure your hands are free of any dirt and debris while you work. 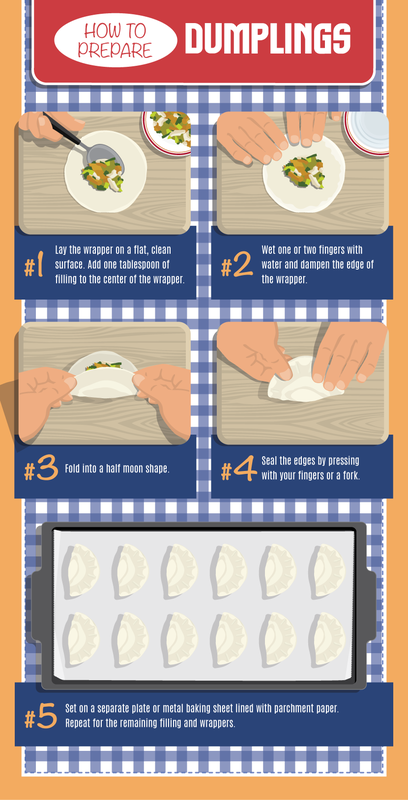 To make basic beginner-friendly dumplings, opt for circle-shaped wrappers. Add one tablespoon of filling to the center of the wrapper. While it might be tempting, do not overfill each dumpling; otherwise, it may open and explode during cooking. Add some water to the edges and press closed into a half-moon shape. Need some practice first? Use loose ground sausage for a super simple recipe before taking on one of these mouthwatering recipes. Over medium heat, sauté the cabbage in vegetable or canola oil. Pour soy sauce and water into the pan. Continue cooking until the water has evaporated and the cabbage has wilted. Once it browns, place the cabbage in a separate bowl and set aside. Add the chicken, minced garlic, green onions, white sugar, and sesame oil. Mix well. Lay the wrapper on a flat, clean surface. Add one tablespoon of filling to the center of the wrapper. Wet one or two fingers with water and dampen the edge of the wrapper. Fold in half and seal by pressing the edges together. Set aside on a separate plate or metal baking sheet lined with parchment paper. Repeat for the remaining dumplings. Add a small amount of vegetable oil to a pan over medium heat. Place dumplings in the pan until it is full; make sure it is not overcrowded. For best results, work in batches. Cook until bottom is golden brown, about 2-3 minutes. Turn dumplings over and pour ½ cup water into pan. Cover with a lid until water has almost evaporated and the dumplings are frying, at least 4-5 minutes. Uncover until the water has completely evaporated. Check to make sure chicken is thoroughly cooked. Combine ground beef, turkey bacon, cheese, onion, Worcestershire sauce, salt, and pepper in a bowl. Mix well using hands. Follow the instructions for construction and cooking above. Cut each onion into quarters. Cut each quarter in half. Sauté onions in butter and oil over medium heat. Add Worcestershire sauce and beef broth to the pan. Cook over high heat until broth boils then turn back down, about 20 minutes. When onions are dark brown, remove from heat and let cool. Add cheese and mix. Follow the instructions for construction and cooking above. These are just a few combinations for delicious dumplings, but as you can see, these versatile pockets of flavor can take on almost any theme! Once you get the basics down, get creative with your filling combinations. Kirsten is an author and lifestyle writer from New York. She’s authored a DIY book and teaches DIY classes, in between traveling and dreaming up delicious new recipes.